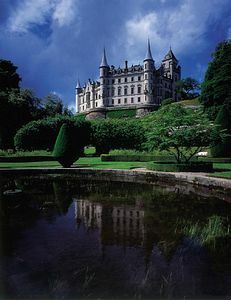 Dunrobin Castle is the most northerly of Scotland's great houses. It is the largest house in the highlands, with 189 rooms and is one of Britains oldest continuously inhabited houses, dating in part from the early 1300s. The Gardens were laid out in 1850 by the architect Sir Charles Barry, who was responsible for the Victorian extension to the Castle and who designed the Houses of Parliament. The arrangement of the Gardens, inspired by those at Versailles, have changed little in the 150 years since they were planted. Despite its location so far north, the sheltered Gardens are able to support a surprising range of plants. Displays of the ancient sport of falconry take place in the gardens each day. In the grounds is a Museum which was originally built as a Summer House by William, Earl of Sutherland, it was extended by the 3rd Duke. The Museum houses a collection of Hunting Trophies, Pictish Stones and other items brought from all over the world, together with many objects of interest presented to the Museum by friends of the Sutherland family. 50 miles north of Inverness on the A9, ½ mile north of the village of Golspie. Dunrobin train station open from 1st April until 15th October.